The history of modern Tibet has produced many amazing women whose tenacity, courage, indomitable spirits and patriotism have been crucial in keeping Tibet’s struggle for freedom alive to this day. They came from many walks of live and from all over Tibet — nuns, nomads, aristocrats, farmers and hermits. Following are some of the Tibetan warrior women, who were gentle, forgiving and compassionate, but who did not hesitate to take arms when their way of life was threatened and when their land was trampled upon by marching boots of the occupying army. They have inspired a generation of Tibetan women, yet many of them remain unknown, as Virginia Wolf said, ‘for most of history, Anonymous was a woman’. Nevertheless, they were true daughters of ma dag sinmo, the mountain ogress, who according Tibetan legend married a male monkey — their six offspring were the first Tibetans. These women held up more than their share of Tibet’s blue sky. Kundeling Kunsang was one of the leaders of the March Uprising in 1959 against the occupying Chinese forces, in which thousands of Tibetan women gathered in front of the Potala Palace shouting ‘Tibet is Independent’. After the Dalai Lama escaped into exile disguised as a regular soldier on 17 March 1959, the Chinese brutally suppressed the popular Tibetan people’s resistance. Tens of thousands were killed, and more were jailed and tortured. In 1969, after 10 years in prison Kundeling Kunsang led her prison mates in protest against Mao’s notoriously destructive campaign of the Cultural Revolution (1966-76). The protest resulted in the execution of Kunsang and thirty other Tibetan women by firing squad, which took place near Sera Monastery, one of the largest and most prestigious monastic institutions in Tibet. In the same year, the Chinese executed Kunsang and others, a young nun named Trinley Choedon led hundreds of horsemen with primitive weapons and attacked a Chinese military headquarter in Drakor district of Nyemo, Central Tibet. Trinley Chodron, was the medium of a legendary deity and during a trance she urged the Tibetan fighters to “kill the people with yellow and blue uniforms.” On 3 June, her group killed 22 Chinese soldiers and cadres. The PLA soldiers eventually overpowered the fighters. Trinley and fifteen of her followers were captured and brought to Lhasa for public execution. The resistance by Tibetan women against the Communist Chinese in the preceding years was equally daring. In March 1956, Gyari Dorje Yudon, the second wife of Gyari Nyima, the chieftain of Nyarong in Kham, eastern Tibet, led the resistance forces’ attack on the Drugmo Dzong (Fort of the Female Dragon), where the PLA’s Eighteenth Army left a reduced number of troops on their way to capture Chamdo. The siege lasted for about the month and the Chinese suffered great losses. When Yudon and her fighters were outnumbered by fifteen thousand soldiers of the Eighteenth Army, they retreated into the hills and continued guerrilla campaigns against the Chinese. That year, Ani Pachen, Tibet’s Warrior Nun, also fell into the Chinese hands. Pachen, the only child of Pomda Gonor, the Chief of Lemdha clan in Kham, Eastern Tibet, had to come back from her reclusive life as a nun to take over the leadership, after her father died in 1958. Soon Pachen led a guerrilla campaign of six hundred fighters on horseback against the Chinese army. They struck at supply caravans, camps, and whatever targets the Red army offered. Inevitably though, the sheer weight of resources and manpower that the Chinese were able to bring smothered the resistance. Many were killed, and many more were captured, as they struggled, half starved, towards the relative safety of Lhasa. 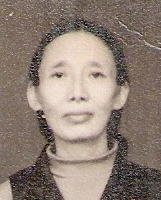 Ani Pachen la was among those who were captured and was jailed for twenty-one years. In the 1980s, a new batch of young women took the mantle of freedom struggle when the Tibetan people peacefully took to the streets demanding independence. 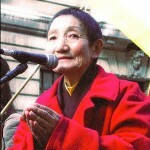 This wasn’t a total change of leadership since old warriors such as Ani Pachen, soon after her release from prison, also joined the protests. But the demographic of the protestors shifted to young people — some barely in their teens. Ngawang Sangdrol, born to a family of active patriot, was detained at the age of thirteen for taking part in a peaceful demonstration. In 1992, she was rearrested and jailed in the notorious Drapchi Prison. Sangdrol and other nuns in defiance of the endless torture, interrogations and constant watch, covertly recorded patriotic songs and smuggled the tapes out of prison. As a result this group of brave nuns, popularly known as Drapchi-14, were given extended prison terms. Sangdrol got a combined sentence of 23 years. Yet, they remain, both in and outside the prison, irrepressible champions of freedom and non-violence on the face brutal Chinese occupation. While Sangdrol and others were being incarcerated in their prison cells, Woeser, one of Tibet’s foremost public intellectuals and author, was using her pen to challenge the Communist rule in Tibet. In January 2003, Woeser published her book Notes on Tibet, a compilation of thirty-eight short stories, in Guangzhou, China. Nine months later the Chinese authorities banned her book. The official indictment accused Woeser of “stepping into the wrong political terrain” and “praising the Dalai Lama and the Karmapa, encouraging belief in religion” and generally “having the wrong political stance”. In exile, away from the harsh and intense Tibetan Plateau, away from the lush green pasture and sky-high snow mountains, Tibetan women are marching forward in equal stride. From forever-on-the-run streets of New York to pavements of London to the crooked pathways of Dharamshala, smart, educated and articulate group of Tibetan women is leading the struggle with their heads firmly on their shoulders. 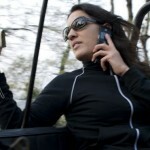 The battlefield has changed so have the weapons but the fundamental demand is same i.e. independence for Tibet. At the forefront of this gang of women that China fears so much is Lhadon Tethong, the super-activist, who headed Students for a Free Tibet for many years. 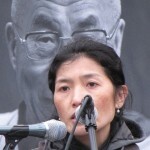 She is now the director of Tibet Action Institute. Lhadon was born and grew up in the West and from early on she realized that all is not well in her homeland, where her father was born. Driven by fierce urgency of now, Lhadon along with a band of like-minded activists made Students for a Free Tibet a household name. One of her defying moments was in August 2007, in the week preceding the one-year countdown to the Beijing Olympics. 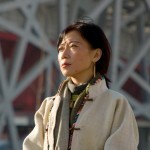 Lhadon traveled to Beijing where she launched ‘Beijing Wide Open’ her blog to report on the Olympic preparations and China’s political usage of the Games to legitimize the occupation of Tibet. She openly traveled around the China’s capital, speaking to journalists, calling the International Olympic Committee President Jacques Rogges from Tiananmen Square, and representing SFT activists who hung a protest banner on the Great Wall of China on the eve of the one-year countdown. Lhadon is the representation of the 21st century Tibetan women — fiercely independent, intensely articulate and undoubtedly brave. While Lhadon leads the powerful international youth movement for Tibet, Dolma Gyari, former Joint Secretary of the Tibetan Youth Congress and the long-time Deputy Speaker of the Tibetan Parliament-in-Exile, has been working within the exile Tibetan establishment. In 1991, Dolma was elected to the exile parliament where she advocates the Tibetan cause and has become an important liaison with Indian community. Perhaps, her greatest strength is her ability to reach out to ordinary people and the politicians with seemingly effortless charm. 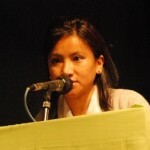 Dolma was also the first-ever Tibetan woman candidate in the election for the exile Tibetan Prime Minister in 2011. Unlike Gyari Dolma, Dechen Pemba, who was born in the United Kingdom, is a quiet rebel. As the editor of popular website High Peaks Pure Earth, Dechen monitors Tibetan websites in Tibetan, Chinese and English languages to observe social trends and for signs of change in and outside Tibet. 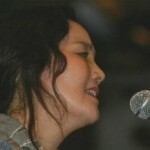 Her website offers a unique and in many cases the united voice of Tibetan blogsphere, where an increasingly large number of the growing up youth spend their time. For those who live in the occupied Tibet, asserting their voices and expressing their aspirations in blogs by averting China’s Great Firewall offers them the hope to sustain their lives under the brutal regime. By examining these blogs and presenting them in a language that is understood globally, Dechen steadfastly counters Beijing’s propagandas and cover-ups. Her presentation of Woeser’s blog entries is particularly important for the outside world to understand the life inside Tibet today. In sunny California far away from Dechen’s often-rainy London, Tenzin Seldon, a brilliant student at the Stanford University and an activist for the Students for a Free Tibet overwhelms Beijing. In early 2010, Seldon’s computer was hacked from China. Seldon remarked, “The fact that the Chinese government is intimidated by a 20-year-old is kind of sad.” But her action speaks louder. In 2011, she won the prestigious Harry S. Truman scholarship for her academic performance and leadership skill, which is bound to further enhance Seldon as a leader for the global Tibetan movement. It is thus little wonder that Beijing is scared and paranoid. Tibetan women winning prestigious scholarship are not a stray case. Kunchok Dolma, a former student of Honors College at Lehman, City University of New York, US, has won a Clarendon Scholarship to pursue graduate studies at Oxford University, England. Kunchok will pursue her M.Phil in International Relations. Likewise, Tashi Lhamo, who was born to a nomadic family in Tibet and later escaped into exile, has won 2011 Gates scholarship from Bill and Melinda Gates Foundation, which will pay all her expenses to a doctorate degree. Lhamo graduates this year near the top of her class. In an entirely different field, another young Tibetan woman has excelled. 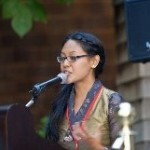 Dhardon Sharling, an activist for the Tibetan Women’s Association, is elected for the exile parliament. Sharling outshone some of the veteran politicians in the election. Along with a few other new faces, change may dawn for the legislative branch of the Tibetan democracy. This next generation of Tibetan women leaders is confident, competitive and compassionate, but they will not compromise in their resolve to fight for Tibet. They are well poised follow the footsteps of our warrior women such as Kundeling Kunsang, Trinley Choedon, Ama Adhe and Ani Pachen, who sacrificed so much for Tibet under such terrible circumstances. All I can say then is — CCP beware Tibetan women are coming. Are the Speaker and Kalon Tripa stifling free speech? Can Some Good Come From the RFA Controversy?